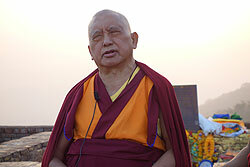 Lama Zopa Rinpoche at Nalanda, India giving the oral transmission for Lama Tsongkhapa’s Praise to Dependent Arising, February 2014. Please Rejoice with Us: FPMT Annual Review 2013 Out Now! Pujas to Be Offered on Losar for All Serving FPMT! Lama Zopa Rinpoche teaching on the Heart Sutra at Vulture’s Peak, India as the sun sets, February 2014. 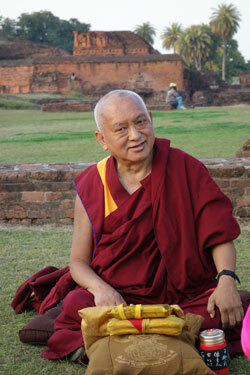 Find a full range of advice from Lama Zopa Rinpoche on Rinpoche’s Advice page. Go to the Lama Yeshe Wisdom Archive. His Holiness the Karmapa and Lama Zopa Rinpoche walking together from the Maitreya School to Root Institute, India, February 2014. 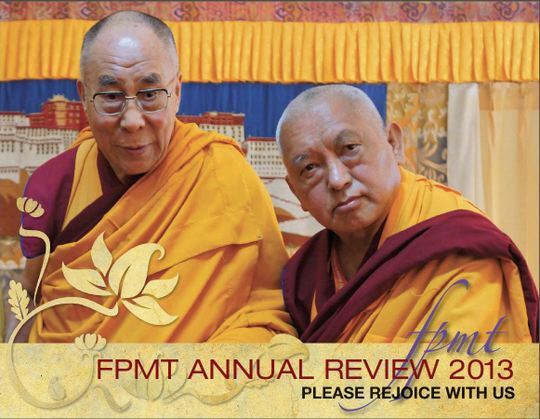 We are so happy to bring you your FPMT Annual Review 2013, entitled Please Rejoice with Us. In this review you will find Lama Zopa Rinpoche’s letter about the benefits of the work of the FPMT and offering service to the guru; the handing over of the land in Kushinagar, India to Maitreya Project; and many, many other achievements! The digital version (as a PDF and an ezine) is available for you to read and download now! We will mail copies to FPMT centers, projects, services and study groups as soon as it comes back from the printer. Compiled from various teachings by Lama Zopa Rinpoche, Benefits of Medicine Buddha Mantra and Practice details the many blessings associated with engaging in Medicine Buddha practice. FPMT Education Services is happy to offer this compilation for free. A new Basic Program Online subject, Grounds and Paths of Secret Mantra, is available on the Online Learning Center. The course is based on the video recordings of the exceptionally precious teachings by Kirti Tsenshab Rinpoche on the subject. Instructions for the nyung nä practice are included as one of the subject completion retreat options. Offering gold to the Jowo Buddha in Tibet is just part of the Losar activites sponsored by the Puja Fund. Photo courtesy of FPMT Charitable Projects. Every year during Losar (Tibetan New Year and the 15 Days of Miracles) the Puja Fund sponsors an incredible array of pujas and offerings all over the world on the advice of Lama Zopa Rinpoche. This year these pujas will be offered from March 2-16. This is something amazing to rejoice in, to mentally offer and dedicate towards, and is also something you can participate in by donating any amount. An example of the pujas performed by Sangha at monasteries include: recitation of the Prajñaparamita (three versions), Druk Chu Ma and Medicine Buddha puja. These pujas are offered by over 9,000 Sangha. Many more activities and offerings are sponsored over Losar, such as offering gold to the Jowo Buddha in Tibet, robes to the Buddha in Bodhgaya and offering saffron and new paint to the Boudhanath and Swayambhunath stupas in Nepal. Please rejoice! When the pujas are performed, Sangha read extensive dedications prepared by Lama Zopa Rinpoche, and offer the merit to the long life of His Holiness the Dalai Lama, and to the removal of obstacles to FPMT’s Dharma activities. Merit is also dedicated to FPMT students, benefactors of centers, projects and their families, to all who have passed away, and to the benefactors of the Puja Fund. We have less than two months left to collect Merit Box donations for the 2014 Merit Box Project grants. Please make your donation now and help support this year’s grants, which will give much-needed aid to centers, projects, services, study groups and initiatives that fulfill the mission of FPMT all over the world. Find out how to send in your donations. You can receive Mandala blog posts daily, delivered directly to your email address or receive our content using an RSS reader or web-feed aggregator. Enjoy “FPMT News Around the World”, “Lama Zopa Rinpoche News” or “Advice from Spiritual Friends,” to receive the most up-to-date news from Lama Zopa Rinpoche and the entire FPMT community, as well as inspirational photographs and quotes from our teachers and guides. Ven. Roger Kunsang, Lama Zopa Rinpoche, Ven. 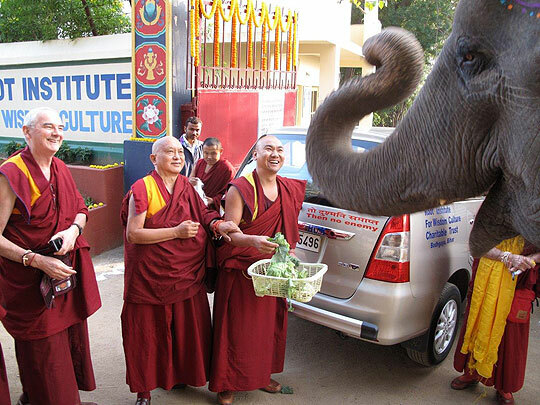 Tendar and Bodhichitta the elephant at Root Institute, India, February 2014. Photo by Ven. Trisha Labdron. We recently got a beautiful collection of malas. If your center has a wholesale account, you can enjoy them with a 15% discount. Check them out here! Lama Zopa Rinpoche taught in IMI House in Sera Je Monastery, India to over 60 IMI monks and nuns who were attending the Jangchup Lamrim teachings with His Holiness the Dalai Lama, January 2014. “The year began with the four-legged residents of the Animal Liberation Sanctuary of Kopan Monastery, Kathmandu, Nepal moving to their new living quarters on land nearby. The move took place over a couple of days with 48 goats and 2 sheep being led (or often the other way around!) by several workers from Kopan. The track is very steep and narrow in places, so we were quite anxious that the more compromised animals, like Dawa the three-legged sheep and Norbu with his partially amputated leg, may not make it. But they all arrived safely, although very exhausted, and set straight into munching on the grass and leaves. We look forward to them all having a long and healthy peaceful life there …” Read more. Tong-nyi Nying-je Ling, Denmark would like to appoint an In-Depth Buddhism registered resident teacher; Milarepa Center, USA has new work-study positions available.